This German made, Timor Pure open tooth comb safety razor is good for all types of skin including sensitive skin and all beard types from light growth to tough, coarse bristles. 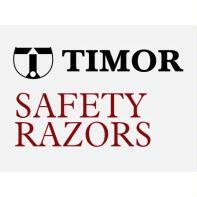 Timor safety razors have long been known for their beautiful design and finish as well as being mild yet very effective shavers. A major benefit of this razor is the low profile head which lends itself very well to shaving under the nose and shaving beard lines and sideburns accurately. Additionally and I don't know why other manufacturers don't do this, the head is long enough to enclose all of the safety razor blade - no protruding ends to cut you when you change blades. The handle is machine tooled to deliver a firm grip while you shave, the finish is much nicer to look at and to hold compared to knurling. Read here about the differences between open comb versus closed comb safety razors. Made in Germany. The handle is solid brass while the head is a metal alloy, both are plated in a particularly high quality shiny chrome finish. The razor comes with 10 Timor, German safety razor blades and a Timor, Giesen & Forstoff branded presentation box. On a par at least with Muhle and Merkur in terms of finish and shaving pleasure. Timor have worked out how to manufacture a close shaving yet mild open comb safety razor. The razor has good heft and it will deliver a mild yet very close shave. Zinc die cast head, solid brass handle with a shiny chrome plating.